Equity is slippery. While its definition might be relatively straightforward, accounting for it is not, particularly in light of a dynamic environment that delights in complicated transactions that even seasoned accountants can find confounding at times. Acquisitions, consolidations, parents & subsidiaries, stock comp, and a list that sometimes seems a mile longer -- equity accounting comes from all angles and requires a steady, well-informed hand from your accounting and finance teams to make sense of it all. While Embark will spare your eyesight and patience by avoiding a deep dive into the granular details of equity accounting -- and the danger of running low on server space given the scope of the topic -- we wanted to provide a few considerations to keep in mind to help your team keep the many moving parts in proper order. Therefore, find a comfortable seat, a cup of your preferred beverage, and take note of the following considerations, explanations, and best practices around equity accounting. Cost: Your controlling interest is less than 20%, giving you a nominal level of influence. You record the holding as an asset on the balance sheet with a value equal to the purchase price. Equity: Your controlling interest is between 20% and 50%, giving you a significant level of interest in the company. You book the acquisition on the balance sheet atcost and report net income based on your portion of controlling interest. Consolidated: Your controlling interest is 51% or higher, giving you control over the company and requiring consolidated financials. The subsidiary’s income, expenses, and assets are rolled into your own. As an example, let’s say you acquire 25% of a company worth $4 million. In this instance, you would use the equity method, valuing the company as a $1 million asset on your balance sheet. If the company reports $800,000 of net income, you report $200,000 as earnings on your income statement. Alternatively, if you acquire 51% of the company, you have a controlling interest in it and must use the consolidation method. In this instance, you report the entirety of the $800,000 net income on your consolidated financials. Transactions between a parent company and a subsidiary can be especially confusing from an equity standpoint. In even the most complex cases, though, a simple review of the ownership documents can provide much-needed guidance from a source that accountants sometimes overlook. For example, if a parent company pays a bill for a subsidiary and it clouds the equity accounting picture, a good first step is to review the ownership documentation -- whether that’s articles of incorporation, a partnership agreement, or a joint venture agreement. Equity is a shapeshifter, taking the form of partnership equity, common stock, additional paid-in capital, or other forms depending on the circumstances. Therefore, when things are especially hazy, see what the ownership looks like for a sense of direction and ask yourself a few simple questions. Are you booking entries as events occur? For instance, when a parent is contributing cash into a subsidiary, does that subsidiary ever intend on repaying it? If not, then you book those contributions as equity rather than a loan. Intent speaks volumes in these types of scenarios. Also, remember that equity doesn’t appear out of thin air and, like it or not, you’ll never have an equity tree growing in your yard. Someone must transfer something -- maybe by contributing assets like cash or cash equivalents, settling liabilities on behalf of the entity, or even services like in the case of stock comp. You can’t promise someone a percentage of equity if it never existed in the first place. To look at a simple example of booking equity, if a normal company contributes cash to a subsidiary that has no intention of paying it back, then that contribution is booked as equity. Taking it a step further, if that company gives $50 to buy one share and the par value of common shares is $1, then the parent books the contribution as a single share at par plus $49 of paid-in capital, which is also considered equity. Such a thought process holds true even when the contributions aren’t in cash. 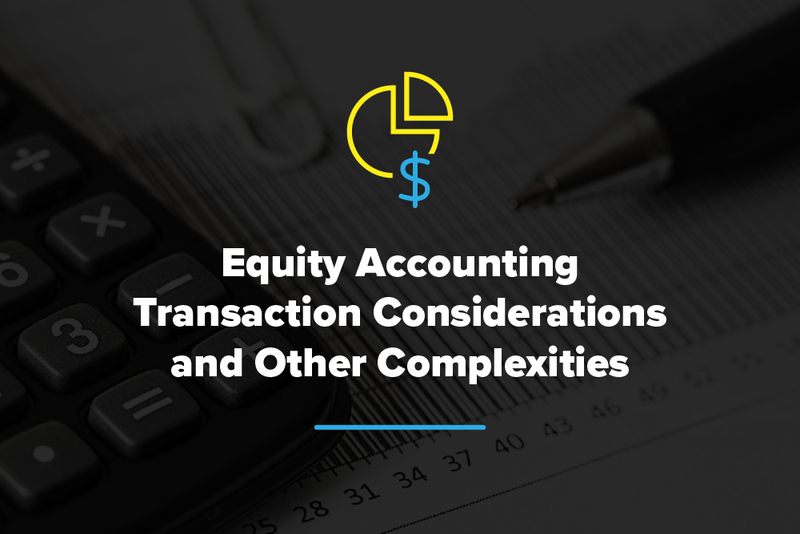 As evidence that equity accounting encompasses a variety of sources and needs, not just transactions, note that many forms of stock compensation affect equity accounting as well. Sure stock comp can be a part of an incentive triggered by a transaction, but stock comp is also an everyday occurrence. In other words, like it or not, equity accounting isn’t just for those special occasions, like the financial equivalent of a Thanksgiving turkey. Thanks to items like stock compensation, your accounting and finance teams might be nibbling on financial turkey sandwiches all year long. Executive compensation packages, for example, often entail equity considerations since you’re issuing stock -- maybe through options converted to stock at some point or grants that are just shares given to an employee. Either way, those incentives carry equity considerations that a company must account for which, in the case of a grant, is a straightforward entry to your equity whenever you grant the shares. Options are more complex, requiring you to expense them over the period the employee earns them. In this case, the options won't impact your equity until they vest and the employee pays the strike price, assuming, of course, they’re in the money and not underwater. Sure, such a consideration isn’t even a blip on the equity radar for a massive corporation, but for a startup, options can play a much more dramatic role on a company’s equity accounting. Obviously, there are countless other considerations in your equity accounting. Aside from what we’ve discussed, always consult the guidance for any special circumstances you might encounter and make sure your equity roll forward properly reconciles. Lastly, never forget that Embark is always here to lend you our expertise and experience along the way. You’re not alone in your equity accounting trials and tribulations, but we suspect you already knew that.